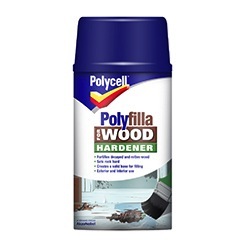 Polycell Polyfilla for Wood Hardener is a specialised liquid formulation that penetrates deeply into exterior and interior decayed or rotten wood. It hardens the softened fibres, seals the surface against moisture penetration and forms a solid base for filling once dry. Penetrates deeply into decayed or rotten wood. Reinforces and hardens softened wood fibres. Provides a solid base for filling. Maximises the durability of any wet rot repair. Shake can well prior to use. Decant product into the cap and apply liberally to the affected and immediate surrounding area with a paint brush, ensuring full saturation of the wood for maximum absorption. Note: Drilling small holes into the affected area can achieve an even deeper hardening effect. For best results apply 2-3 coats and leave to dry for 6 hours. 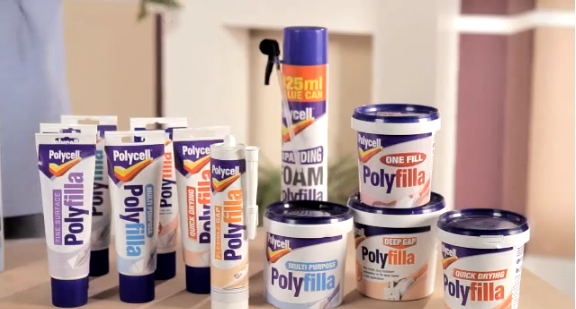 Remove excess product with a wire brush before filling the damaged area with Polycell Polyfilla for Wood Large Repairs. Prior to painting, staining or varnishing, sand off any remaining wood hardener.